Most cities have a skyline that serves as a kind of graphic shorthand that indelibly stamps its unique sense of place. These visual mnemonics also apply to natural features, so much so that the place simply isn't the place unless the backdrop is in place. When the twin towers of the World Trade Center vanished after Sept. 11, 2001, the skyline of New York was changed, and New York itself seemed altered. Featuring Gaye Chan, artist and designer for "Waikiki: A History of Forgetting and Remembering"
Now imagine Waikiki without Diamond Head. Ding! Your time is up. Impossible, yeah? This intersection between social reality and cultural expectation is one of the many fascinating themes woven into the new University of Hawaii Press book "Waikiki: A History of Forgetting and Remembering" (2006, 188 pages, $29), by art historian Andrea Feeser and photography professor Gaye Chan. At first glance a pleasant coffee-table picture book, it's actually something a bit more intellectually compelling and culturally subversive -- a dialectic pingpong match between the forces of sacred nature and pell-mell capitalism. "I look at it through class, politics, race -- all the hegemonic values of society," says Chan, who's giving a free talk on the book Thursday. "It's largely based on what we wanted to record, and also what is in the archives and photo albums and in advertising. All of that! Waikiki as a site is the intersection of a number of things simultaneously. Waikiki is particularly fertile for that. It's not like Kaimuki or an area like that." Waikiki was once an area of wetlands and duck farms and the vacation homes of Hawaiian alii. But then -- as the book's Amazon.com critique puts it -- the tale of how "Waikiki's conversion from a vital self-sufficient community to a tourist dystopia is one of colonial oppression and unchecked capitalist development." If you build it, they will come. But if it's already there and looks swell, hey, cash in on it. "How many pictures have we seen of Waikiki Beach -- and how has the beach been constructed to match the pictures? Diamond Head is an amazingly iconic image," says Chan. "I wanted to demonstrate how Diamond Head, as a profile, has become a signature of being there. If it's not included, then you were never there! We quote someone who talks about the repetition of images, to the point of foreclosing on any other possibilities of looking at a space. Diamond Head and Waikiki have become the 'brand' of the state; whatever doesn't match up to market image is simply not seen." Artists drew it, of course, but the objectification of the landmark was developed hand in hand with the creation of photography and worldwide popular culture. Cameras really didn't become common until the advent of Kodak's Instamatic. Prior to that, they were in the hands of a trained elite of technocrats. Camera clubs flourished, fed by point-and-shoot cultural iconography such as the Kodak Hula Show. "And now, with the digital revolution, it's getting even more common," said Chan. The easier it is to make, the easiest it is to share. But the pictures in the book aren't conventional. They not only look like commonplace snapshots, they're sometimes dirty and stained and manipulated and folded. According to Chan, "the accretion of externalities on the photo are part of its history." "As a photo historian and an artist, I want people to look at pictures' physicality," explained Chan. "Leaving the tears and the stains and the wormholes will hopefully engage people into wondering what happened to the actual picture over the years, from the very beginning. Some of the things I found were right off the street. 'How did THAT happen?' you wonder. History leaves a residue." We learn to look at images of Waikiki that support a prepackaged expectation, without seeing people actually in the industry. This warts-and-all approach "makes us examine what should be remembered and what should not. 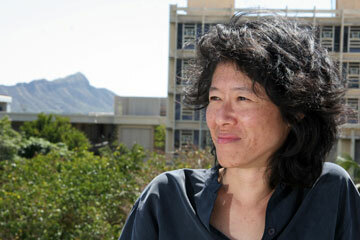 Most of the detritus tells us something," said Chan, who then admitted she did erase a couple of wormholes, though. Some of the pictures were further manipulated to make a social or artistic point, forcing the viewer to become more engaged in "reading" the images. "We're living in the age of transition between darkroom photography and digital photography. I learned my aesthetics of imagery years ago in the darkroom, and have since moved on to using digital tools," said Chan. 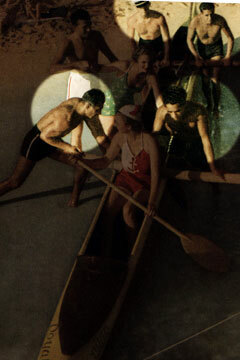 "Some of the pictures in the book were manipulated digitally, and others were done in the darkroom. I try to keep it consistent, however." Another trick used in "Waikiki" is an iris effect to spotlight the largely invisible tourism workers in crowd pictures. Feeser and Chan are trying to provoke readers into being active participants rather that passive viewers. "All photos are time capsules. But the book is better at serving that purpose if you know how to look at photos actively." While working on the book, Chan became "curious about whether there's any link between the color of the Kodak film box -- red and yellow -- to Hawaii. When the show started and the year the film came out was about the same time. And when you're dealing with color film, Kodachrome is just the best," she rhapsodized. Kodachrome? That capitalist tool? Without it, our collective memory of the blue water, golden sands and brown-green volcano of Waikiki would instead be the muddy, rotting reds of aged Anscochrome or the sickly algae shades of faded Ektachrome. "You press the button, we do the rest," was Kodak's first ad campaign more than a century ago. Now, it seems, the pictures are pressing OUR buttons. 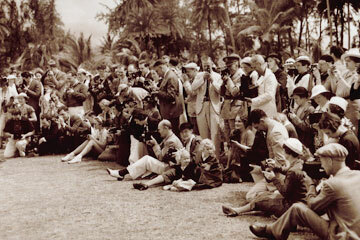 Camera clubs that introduced citizens to photography skills also created packaged sales events like the Kodak Hula Show. In the late '90s, Honolulu Hale opted to recognize the city's centennial by deciding that, like Athena from the head of Zeus, Honolulu sprang full-grown on a specific date: late 1905, when the Territorial Legislature created the five counties. Prior to that, Honolulu was apparently nascent, lazily dreaming, perhaps, of the day she could awaken and join the great municipalities of the world. 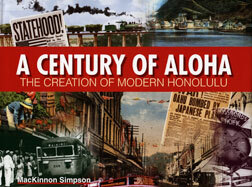 The century -- plus two -- since Honolulu became a corporate entity has been neatly summarized in this picture book by Honolulu writer Mac Simpson. He has a good eye for image choice and manages to stay away from clichés and visual filler. "A Century of Aloha -- The Creation of Modern Honolulu"
His writing -- always in service of the images -- is clear and cohesive and doesn't wander off track. The printing is crisp and clear, and if one needed an instant reference on where Honolulu has been, this would be a top choice. Alas, the first edition of this book has been somewhat sabotaged by production errors. Many of the pictures suffer from pixilation, digital ghosting, screen moires and other basic goofs. Others look fabulous. Let's hope Mutual sends this back into the woodshed for the second printing. It's worth it.